Hey Teens! Don’t forget to swing by the Library for Service Club on Monday, February 11th at 4:00 pm. We will be decorating collection boxes for the Chelmsford Public Library’s PJ Drive! The Chelmsford Public Library has teamed up with the Boston Bruins to participate in their annual pajama drive to benefit DCF Kids and Cradles to Crayons. The PJ Drive’s goal is to collect 12,000 pairs of new pajamas for children and teens in need. 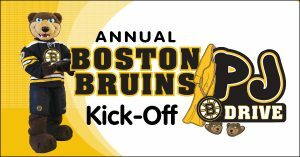 The Boston Bruins PJ Drive runs from February 1 through March 15, 2019. The library will be collecting new pairs of pajamas for babies, children and teens. So bring your creative ideas and help us make some eye-catching donation boxes! If you are able to bring a pair of new PJs to donate, you can kick off our drive and help kids in need! For more about the drive, check out the Cradles to Crayons page here.